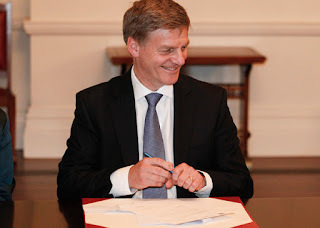 New Zealand's Prime Minister, Bill English, has an honours degree in English Literature. He is described as a 'social conservative' in Wikipedia and worked in Treasury as a policy analyst before becoming an MP in 1990. Over his political career he has worked hard at changing the definitions of many words in common usage and, in his previous role as Finance Minister, has created a dictionary based on his political philosophy and neo-liberal economic perspectives. Auckland proper noun property investors paradise that needs more motorways. beneficiary noun a lazy person of no economic value (probably on drugs) who should be working. Being on a benefit is equivalent to being hooked on drugs removing them is the best thing we can do. compensation noun something to be avoided at all costs. corporation noun the ultimate institution that deserves protection and subsidies. development noun money making venture that deserves government support. Dipton proper noun my childhood home that once provided a lucrative perk. economy noun a financial system that serves and protects the wealthy. education noun something that is dominated by socialists and unions that needs to be heavily controlled by standards and greater ministerial control. environment noun contains useful resources to support development but environmental protection impedes development. farm verb an essential economic activity that needs to be protected from environmental controls. govern verb conduct the policy, actions and affairs of a country with the guidance of business and corporate lobbyists. hospital noun an institution that provides health care with a minimum of funding. humanitarian adjective the last criteria to be considered when constructing government policy. Invercargill noun a city that is close to Dipton and isn't a property investors paradise and has no need of motorways, but has some value a service centre for farmers and as a shearing venue. jeopardy noun the bottom line for government activity is avoiding legal jeopardy. One way of doing this is through legislative amendments done through urgency. kingmaker noun bloody Winston...(I guess I can make him Foreign Minister, if need be, as he will probably get on well with Trump). legislate adjective the process of changing laws to support development and protecting the government from jeopardy. market noun the economic environment where commercial activity occurs and is the key determiner of social and environmental policy. New Zealand noun the title used to identify and define us as sporting nation. The borders do not exist for trade and investment and anyone with money can obtain residency. OECD noun (abbreviation: Organisation for Economic Cooperation and Development) a useful organisation for comparing New Zealand's GDP with others, but to be ignored for social comparisons. politics verb the art of remaining in power through popular support. Crosby Textor have written the bible for this activity and managing public perceptions. queer noun an unnatural state of being for some people that must be tolerated to remain in power (according to Crosby Textor). revenue noun government income that is used to subsidise businesses and corporate entities. Solid Energy proper noun a state owned enterprise that I had great hopes for but I don't like to talk about now. tax verb the process of collecting revenue through minimising the demands on the wealthy and maximising the income from lower income earners. trade noun this word should always be preceded by the word "free". For corporate and business interests around the world New Zealand should be the easiest place to do business. There is a necessary social and environmental cost to this that we just have to accept. urgency noun process used to protect government interests and save developments but inappropriate for addressing issues related to housing, child poverty and climate change. vague adjective describes the way social and environmental issues need to be managed to give the appearance of action when not actually doing anything of substance. work verb something that workers do for their employers for as little as possible. Low wages give us an economic advantage. worker noun a commodity or useful production input. The best of these come from overseas as the local ones are "pretty damn hopeless". xenophobia noun a label used for those who oppose using cheap migrant workers and want to limit overseas purchasers of New Zealand property. youth noun a demographic full of lazy drug addicts. zealous adjective the way I approach limiting government spending on health education and welfare. This is to ensure I can claim budget surpluses and to give the appearance of responsible economic management. The next Government will have to bear the cost of rectifying my underspending. Brilliant. Sharing.. just one to add... Any National Government caused, driven or to ignore Crises = Artificial in Blinglish..